Bronx, NY – Making a dramatic expansion of The New York Botanical Garden’s important and popular edible gardening program, Chairman Maureen K. Chilton, Chief Executive Officer and The William C. Steere Sr. President Gregory Long, elected officials, and other Botanical Garden leaders and supporters participated in a groundbreaking ceremony on October 27 to start construction of the Garden’s new Edible Academy. Building on generations of success, the Ruth Rea Howell Family Garden will remain as the centerpiece of this state-of-the-art complex for teaching children and families how to grow and prepare healthful fruits and vegetables and for promoting the benefits of plant-based nutrition. 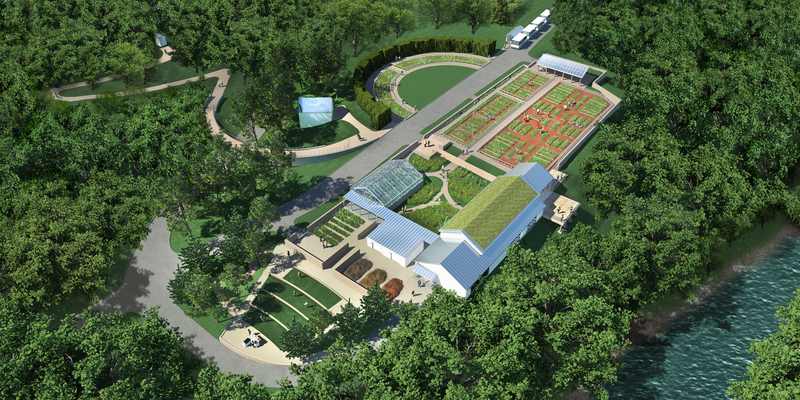 With the three-acre facility’s combination of indoor and outdoor spaces, the $28 million Edible Academy will allow the Garden to offer a bigger and broader range of educational programs and hands-on activities throughout the year, doubling the number of children, parents, teachers, and other visitors served from 50,000 to 100,000 annually. Construction is scheduled to be completed in spring 2018. Designed by the esteemed architecture firm Cooper Robertson, the Edible Academy will incorporate many notable features to enhance learning while minimizing environmental impact. The Edible Academy complex will include an environmentally sustainable building with two high-tech classrooms and a green roof, new display gardens, a 350-seat terraced amphitheater, and composting toilets. Geothermal wells will supply heating and cooling for the Edible Academy Building, and a free standing solar pavilion will help power the facility as well as provide a shaded gathering space. The Edible Academy’s sustainability feature are designed to meet the criteria for certification as a Leadership in Energy and Environmental Design (LEED) Gold project.